Happy Towel Day! Here’s a look at my annual Towel Day post. Towel Day is an annual celebration on the 25th of May, as a tribute to the late author Douglas Adams (1952-2001). On that day, fans around the universe proudly carry a towel in his honor. 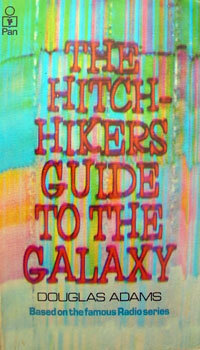 As part of the celebration, I offer you a few things you may not know about The Hitchhikers Guide to the Galaxy. 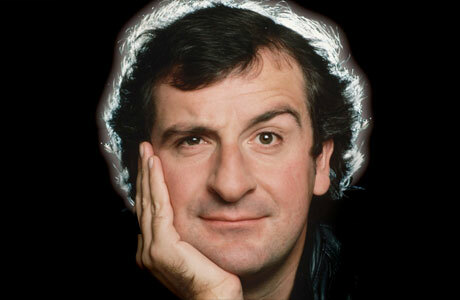 Douglas Adams was born on the 11th of March 1952 in Cambridge. He was an English writer and dramatist. While Adams was studying in Cambridge he hitchhiked from Europe to Istanbul, working various jobs to generate funds for it. After leaving school he tried his hand at comedic writing. Adams was “discovered” by Graham Chapman. They became friends, which led to Adams making a few brief appearances in the series ‘Monty Pythons Flying Circus’. But Adams writing style was not fit for the style of radio or television of that time which proved to be a hindrance in his success and led to bouts of low self-esteem and procrastination. Adams was never comfortable with fame and it took years for him to finish each book. In fact the first book ends abruptly due to the simple fact that because Adams was taking so long to adapt the radio series into book form the publishers called him asking that he simply finish the page he was writing. The first episode aired on BBC Radio 4 on Wednesday, March 8, 1978, at 10:30 pm. 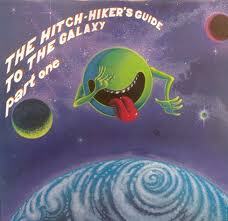 The Hitchhikers Guide was original a radio series idea. The initial idea for The Hitchhiker’s Guide to the Galaxy came to Douglas Adams while lying drunk in a field holding a copy of The Hitchhiker’s Guide to Europe, staring up at the night sky. The original concept was called The Ends of the Earth. The idea was that at the end of each show, the Earth would be destroyed in a new and interesting way. As Adams wrote he realized he needed a guide, one who could explain the various cultures that bring about the ends of the earth, so the character of Ford Prefect was born. Prefect was not the main character, that would be Arthur Dent, but he role was central to the stories. Adams needed a strong central figure because he did not outline his stories. Adams admitted he “made things up as he went along”, which is why so there are so many plot twists and turns. Adams had no idea what would happen next or where the stories were headed. Most of his most well known characters and plot devises stem from his “just winging it” writing style. If you live in America and are a fan of the series, this symbol is very familiar. It’s known as the Cosmic Cutie. But did you know Adams hated it? He asked to have it removed from the book jackets but the publishers refused. Why? Because Adams took so long between books it was designed by the publishers to visually connect the books. They were afraid readers wouldn’t know they were part of the same series. 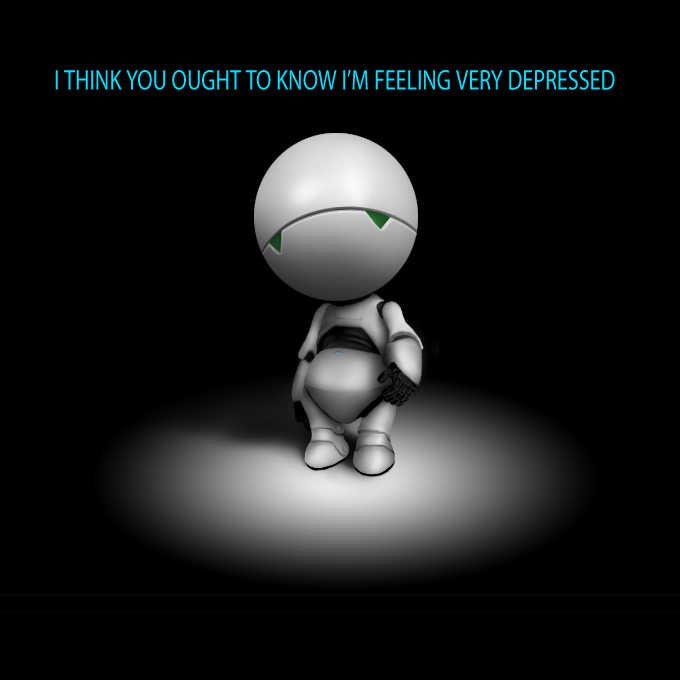 Marvin is a severely depressed robot. He’s so depressed that, when he gets bored and talks to other computers, they commit suicide. His depression is due to the “Genuine People Personality” he received while he was being manufactured. Originally Marvin was to be used in only one episode as comic relief, but proved to be very popular and so became a recurring character. Adams realized early on he had painted himself in a corner. How was Arthur to understand the man aliens he encountered? Having Prefect translate would use up limited air time so Adams had to come up with way to save time. According to the first book, The Babel fish is small, yellow, leech-like, and probably the oddest thing in the Universe. It feeds on brainwave energy received not from its own carrier, but from those around it. It absorbs all unconscious mental frequencies from this brainwave energy to nourish itself with”. Making stuff up as he went along created problems for Adams. How do you get your characters out of tight situations? Infinite Improbability, the most favorite of all the technology in the series, was created to get Adams out of a corner he’d written himself into. Adams came up with the idea after writing an episode that ended with Ford and Arthur being shot in open space without spacesuits; Adams no idea how to save them. It was absurdly improbable that any spaceship would come along and rescue them in time, so Adams created the Infinite Improbability Drive to make it plausible. This allowed Adams to create a universe in which anything could and usually did happen. Answer to the Ultimate Question of Life, The Universe, and Everything- 42. Books have been written about Adams answer to life’s most pressing question. Scholars, mathematicians and philosophers have all weighed in on what Adams meant by the number 42. It is ironic that humans are so obsessed with this question that many see value in Adams nonsensical answer. To him the answer is obvious; life is random and meaningless. When asked about his answer, Adams said: “The answer to this is very simple,” “It was a joke. It had to be a number, an ordinary, smallish number, and I chose that one. When traveling great distances it is always a good idea to pack smartly. Of all the things you must have, which is the most useful? For Adams it starts with a towel. “So long, and thanks for all the fish”. I fell in love with the book, then found the radio series. I’ve never seen the TV series…wonder if it is on Netflix? The film was fun, yet rather disappointing. It seemed to lack the humor of the radio series. Visuals are a real distraction from what is essentially a word-based comedy; the radio original is the best though I haven’t listened to it since it was first broadcast. You can catch a flavour of the TV version on YouTube. The TV series has its moments, notably the wonderful (pseudo-) computer graphics in the ‘Guide’ sectons – those graphics, and the accompanying voiceovers, are wonderful. So true as many of the “gags’ fell flat. You can get the radio series on CD. I listened to them about four years ago and find they still hold up. Thanks for the YouTube tip. There’s good stuff in this post. Thanks! Thanks for stopping by Nicholas. Glad you liked it. If was fun writing this post.